"You probably know an autistic person already. Get to know us a little bit better." 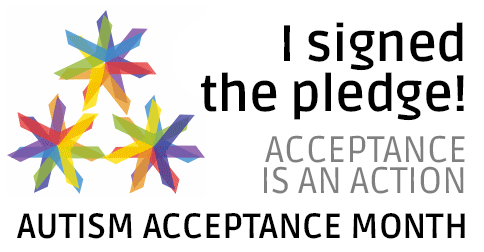 ASAN will be using #AcceptanceIs in April for various projects and conversations. Feel free to join the tag! "AAD has been an ongoing event since 2011. ACCEPTANCE, not "tolerance," not "I accept you but not your autism." Pro-neurodiversity, pro-supports and services, against "cures," AAD was started to counter April "awareness" stunts that demean us. It has expanded to become a way of viewing Autism in a positive and accepting way. autismacceptanceday.blogspot.com"
Use #AutismAcceptanceDay5 to join the conversations! "Awareness first, then acceptance. There is a reason." Specifically: "...the lack of awareness regarding education to Communities of Color related to Special Needs. Not only were there not many communities speaking about Autism, most national organizations did not discuss talking about Autism to Communities of Color. The lack of "awareness" of people of color is apparent in reviewing the lack of diversity in organization boards, campaigns and outreach goals. "Does that mean that we don't understand the importance of "Autism Acceptance?" Not at all. "Because there are few national campaigns such as this one, where the emphasis is on #AutisticFamiliesofColor, the Mocha Autism Network decided to start from the very beginning, to help our communities learn about Autism and its traits, accept them in our community and gain the resources to assist our communities wholistically. And we're getting there. When this organization was conceived in late 2013, there weren't very many talks of diversity in Autism Awareness." "We want to everyone to post selfies wearing red shoes, socks, hats, nail polish or any other item of clothing (etc) to the hashtags ‪#‎WalkInRed‬ and ‪#‎WalkInRed2015‬ to promote ‪#‎AutismAcceptanceDay5‬ ‪#‎AutismAcceptanceMonth‬ & ‪#‎AutismAcceptance‬ in general. We're promoting a flashblog/tweetstorm for April 2nd to draw attention away from ‪#‎LIUB‬ [Light it Up Blue] and will be continuing throughout the remainder of April. This will be an annual event; please like and share, etc. Thank-you!" "April is, of course, Autism Awareness Month. During a month like this, in a literary community like the kidlit world, it’s logical to discuss autistic representation in fiction. Autistic narrators have been dubbed a trend, and however cringe-worthy that designation may be–more on that later this month!–it’s true that there has been a minor explosion in “autism books” over the past decade. Autistic narrators. Autistic siblings. Autistic best friends. Sometimes those characters’ autism plays a central role, sometimes not. In all cases, it’s worth discussing. Representation, as we all know, has a huge effect on readers. Good effects, bad effects. Mirrors and windows." "50% of this Enigma’s sales for the month of April will be donated to the Autistic Self Advocacy Network (ASAN), an organization which the Autism community collectively would like you to be aware of, and to support- instead of Autism Speaks (learn why!). The Autistic Self Advocacy Network seeks to advance the principles of the disability rights movement with regard to autism. ASAN believes that the goal of autism advocacy should be a world in which Autistic people enjoy the same access, rights, and opportunities as all other citizens. We work to empower Autistic people across the world to take control of our own lives and the future of our common community, and seek to organize the Autistic community to ensure our voices are heard in the national conversation about us. Nothing About Us, Without Us!" Autism Acceptance and Awareness Day App Sales! "April is Autism Acceptance Month, and more specifically, April 2 is Autism Acceptance Day! No, this is not a typo. We are shifting from autism awareness to autism acceptance. We need a positive change!" Words for Life will be 50% off on April 2. "LAMP Words For Life™ is a full English vocabulary augmentative and alternative communication (AAC) language app that combines the power of the PRC Unity® language system with Language Acquisition through Motor Planning (LAMP™) principles and strategies. LAMP™ is a therapeutic approach based on neurological and motor learning principles as well as clinical experiences that address the language development and communication needs of children with autism. " On sale for $.99 from 4/2 - 4/5, for Autism Acceptance. "When people are happy they smile. "Kid in Story Book Maker makes it easy and fun to create visual stories to support learning, social modeling, and early literacy with your child as the star character." What Will TPGA be Doing? As for the team here at Thinking Person's Guide to Autism, we have archives bursting with profiles of amazing autistic individuals, posted during Autism Acceptance Months past. We're going to be resharing them all month.